I honestly do not know how to write this review. I can’t get a handle on this experience. 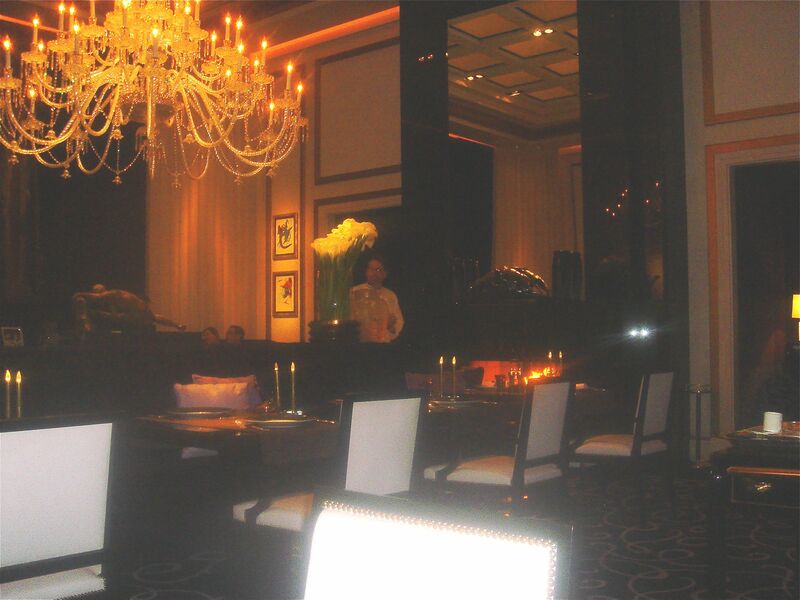 I know that I would eat at Alex at the Wynn at a moment’s notice and that one time at Robuchon was enough. This would seem that I am implying that the food wasn’t good – not true. But somehow, the over-all experience was less than. Somehow, it felt like work – not intellectual in the sense of dining at El Bulli, just not enough sensual pleasure. This is studied dining – perfect presentations, perfect execution, but lacking in soul. The closest dining experience that I can equate it to is Ducasse in Paris. I don’t want to give the impression that the food wasn’t executed perfectly because for the most part it was. The service was equally impressive done in the grand French style with courses delivered on silver trays. So I keep asking myself why I want to go to The French Laundry for as many meals as they will allow me to eat there and I am satisfied that I experienced Robuchon once and have no desire to return. 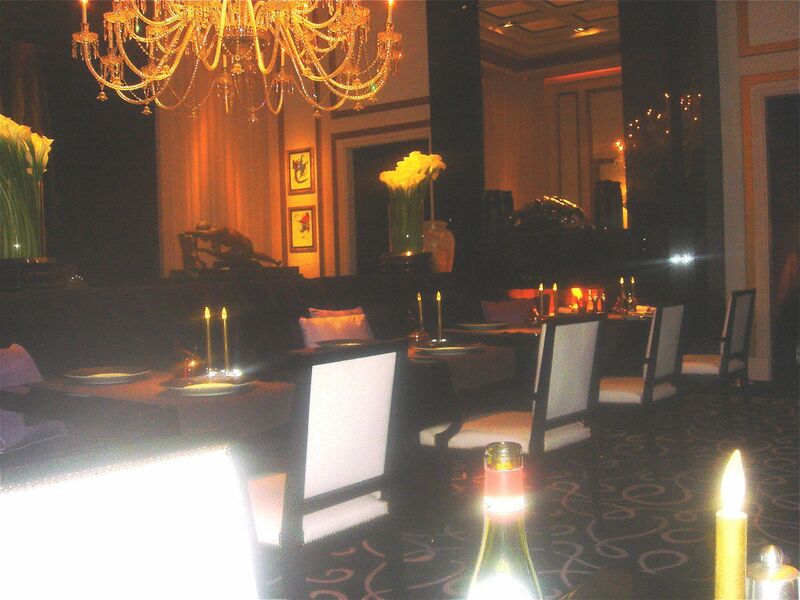 Robuchon is a surreal dining experience. Just the walk through the sprawling casino with the bells and whistles of the slot machines doesn’t seem to fit a fine dining restaurant. 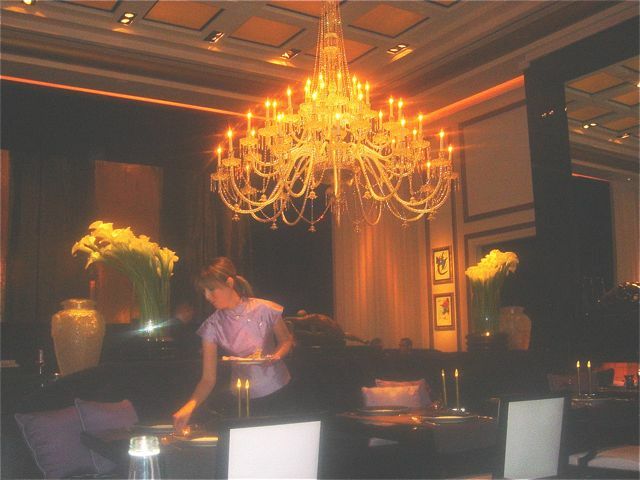 Robuchon is about over-the-top opulence — a huge Swaroski chandelier dominates the room. Flower arrangements are done like the George V in Paris – 2 huge oversized glass vases hold sheaves of calla lilies. The tables are black lacquer with dark linen runners instead of tablecloths. A color scheme of black, “kingly” purple and lavender shrieks sumptuousness. Everything is the finest in French luxury products from the silver by Christophe, Lalique crystal and Croquet cups. The tables are well-spaced and only 40 people can be seated in the main dining room with room for a dozen more on a side terrace and 10 in a small private dining room. The restaurant does one turn a night and does occasionally have to cater to the high roller (or what I would term high loser) crowd. A few nights before our meal, a gentleman had been comped his meal. He had lost $7.2 million — a pretty expensive meal even by Robuchon’s standards. We ordered 2 glasses of champagne, untied our lavender velvet ribbon around our linen napkin and studied the menu. I did ask for the a la carte menu as well. It is extremely difficult to do the 6 course tasting menu and then add on from the a la carte as the least expensive dishes are $75. We eventually decided on the 16 course tasting menu and added one dish from the a la carte menu. (We opted for langoustines instead of the “crispy” egg. We had had the egg at Atelier in Paris. It cost $125 in Las Vegas and $40 in Paris – a big transportation cost, I guess). Our waiter then wheeled over a huge bread cart that was stocked with enough bread to supply a small bakery – foccacio with saffron or basil, brioche plain or with cheese, epi with bacon, milk buns and baguettes. The butter is from Brittany. I decided not to take pictures and didn’t until we were the last people in the dining room. La Pomme: Apple pearl, vodka granite – A long spoon perched on a rock is artfully placed on black slate. The apple pearls resemble small peas and are covered with foamy vodka granite. The sensation is closer to eating caviar in that the apple pops in your mouth. A nice refreshing beginning. Le Caviar Oscietre: Oscetra caviar with haricots vert salad, slices of Parmesan, mimosa (egg yolk and egg white) garnish and lemon grass laced crème fraiche. This dish was so much more than the sum of their parts – it was exquisite – an ode to ingredients. 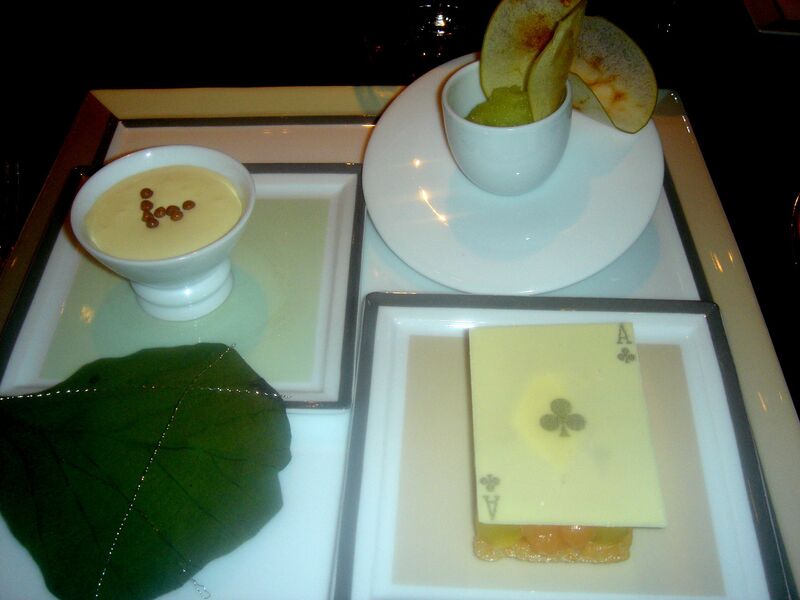 Le Foie Gras: Foie gras, mille-feuille of smoked eel with oriental flavors. The first outer layer was poached cold foie, then lacquered Japanese eel, then another layer of foie and finally eel. To the left was black truffle cream with spices and to the right a julienne of apple and daikon radish “salad.” I was expecting the mille feuille to fall apart when eaten but it held together perfectly so that each bite was an exquisite meld of foie and eel. The mouth feel was an ode to fattiness – extraordinary. Le Thon: Tuna tartar, cold red bell pepper confit with bergamot and dry cured ham. Small diced tuna sat on the red bell pepper confit. It was topped by more red bell pepper and a runny yolk quail egg. Surrounding the mound of tuna were slivers of dry cured ham and chives. Saucing was a yellow bell pepper sauce. I thought the red bell pepper was way too dominant and I ended up deconstructing the dish. This was a beautiful dish, but it was more about show than taste. Our a la carte dish came next. Ravioli of Langoustines with Black Truffle Cream and Savoy Cabbage. This is one of Robuchon’s signature dishes and it was wonderful. The langoustine was enveloped in a ravioli case and cooked briefly. 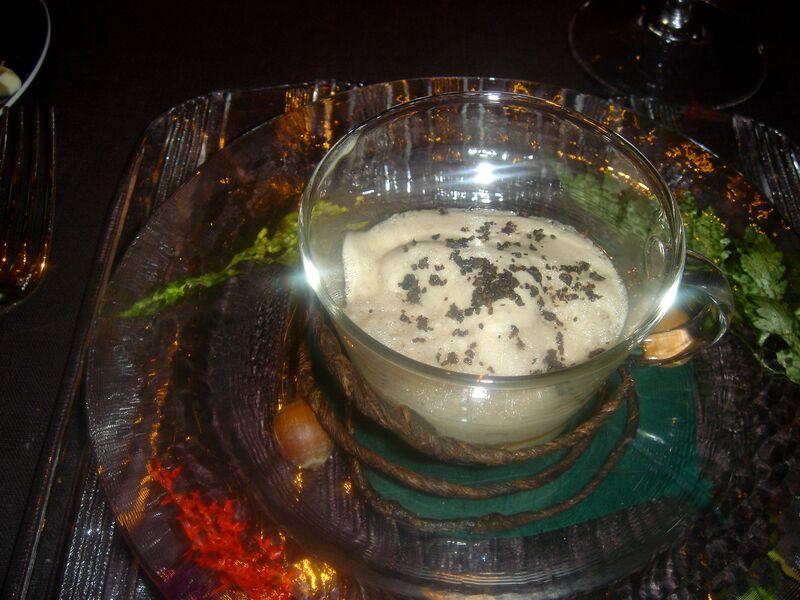 The black truffle cream was unctous and the savoy cabbage meltingly tender. On top of a thin pastry is sautéed onions, smoked ham and then overlapping slices of black truffle. The black truffles were tasteless. I could have been eating black cardboard. Le Parmigiano Reggiano: Parmesan and vegetable veloute with black truffle. On the bottom of the bowl was Parmesan flan, then onion consommé, onion foam and finally flecks of black truffles. It was essential that you mixed this dish and got chunks off solid silky flan with the consommé. L’Epinard: Mille feuille of spinach, truffle and tofu, parsley coulis. This was served with Parmesan foam and a Parmesan crisp. What surprised me most was the duplication of ingredients i.e. the Parmesan. This just didn’t work for me – tofu is tofu. Les Aromates: Medley of aromates in a mild spicy broth. This was chicken bouillon laced with black peppercorns, bay leaf and nutmeg with tomatoes and lettuce slivers on top. John didn’t like this dish at all. I found it somewhat comforting at this point in the meal. Think chicken soup and a stomach-settling course. La Grenouille: Frog leg fritter with baby chanterelles. The frog leg fritter was delicious and I could have eaten 4 of them. The saucing of parsley cream was very reminiscent of Oiseau. The sautéed chanterelles with garlic and garlic chips added the garlic component to a classical way of serving frogs legs. 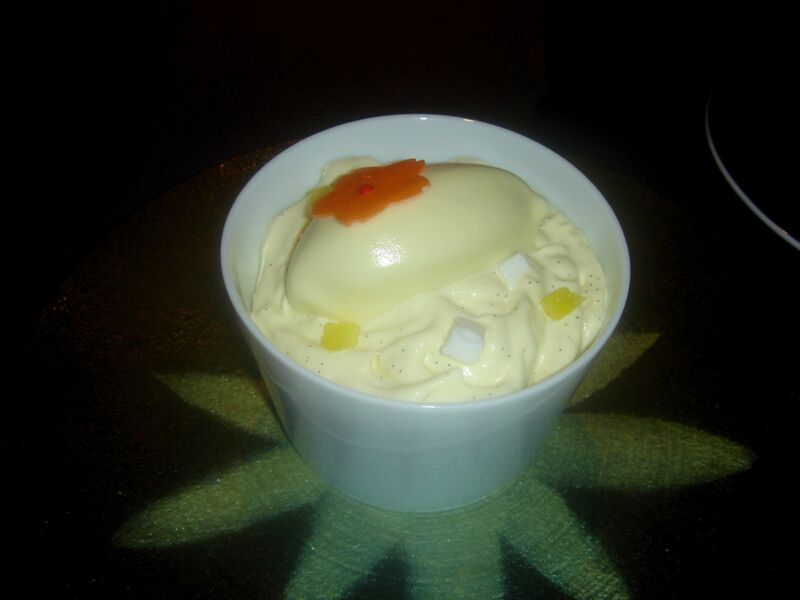 L’Amadai: Amadai in a lily bulb broth. Pan-seared Japanese snapper with yuzu nage, stewed baby leeks and lily bulb. This was perfect – crispy skin, delicate fish – a winner. Unfortunately they served this within seconds of our finishing the frogs leg course. This was a problem at Robuchon that ocurred three times. Sometimes long waits between courses and then one course served right after another. Pacing of the meal was not fine-tuned. Le Turbot: Roasted turbot “on the bone” with celeriac and truffle stew. Roasted Brittany Turbot was topped with julienne black truffles. It was surrounded by chestnuts and celeriac and sat in some type of briny broth. This was good, but not exactly memorable. At this point, we were the only people in the restaurant. We had 6 courses to go plus their mignardises cart. On the bottom of the bowl, poached lobster meat, then a layer of solid saffron and foie gras beurre topped with lobster bouillon. You are instructed to use your rosemary broom to swirl the mixture. When the hot bouillon is added the solid layer dissolves and adds richness to the over-all dish. This was excellent and definitely tasted like a French classical preparation. 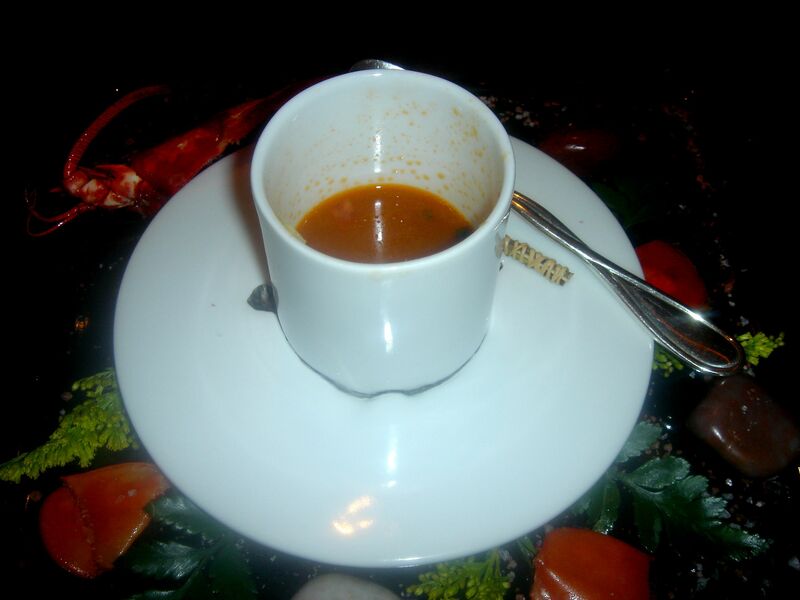 But one of the problems with Robuchon’s food is that many of the preparations mimic soup and your palate becomes weary with this one-sidedness. Le Canard: Duck confit with potatoes, truffled cappuccino – the duck confit was the bottom layer, then it is topped by pomme puree and finally on top the truffled cappuccino. This was another winner — the richness of the duck, the luxurious signature Rubuchon potatoes and the cappuccino added up to an opulent dish. 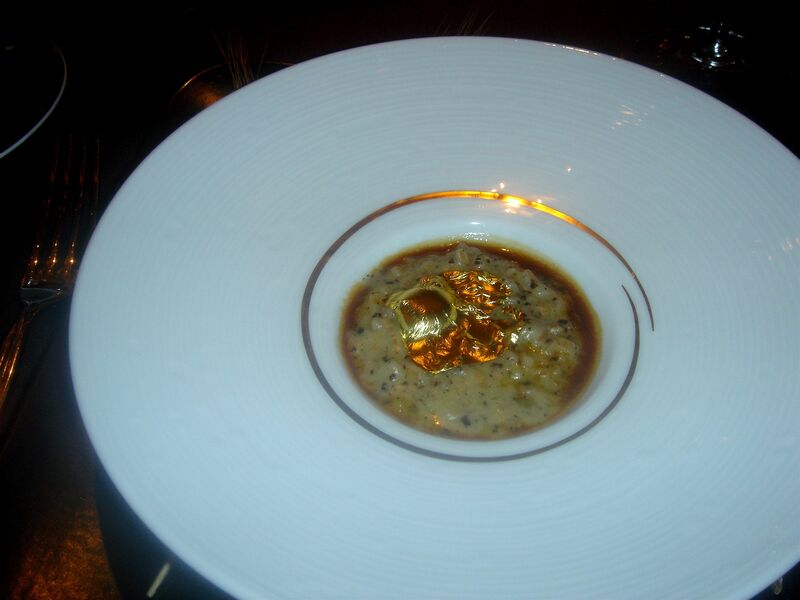 L’Epeautre: Sault wild oatmeal, black truffles, gold leaf. Spelt with Black Truffles, veal stock and topped with gold leaf. This reminded me of Eric Frechon’s signature dish of spelt treated like risotto. We were getting very full and I was uncomfortable that we were the only people in the restaurant with the full staff still in attendance. Most of them were cleaning and resetting the tables. (John’s comment – eating with the janitorial crew is not 3 star dining.) We asked for one dessert and no mignardises, but they wouldn’t hear of it. We did replace the chocolate dessert for something lighter. In the Croquet cup an apple sorbet with a slice of dried apple, to the left a layered affair with fruit – the menu listed it as quince compote Amaretto but that doesn’t seem correct and I had stopped taking notes. In the small cup, I am guessing yogurt and Champagne mousse. How would I rate this meal? I honestly don’t know. They do have a tendency to rush courses. However, service on the whole was excellent – most of the staff are French and have worked in Michelin 2 and 3 star places or are from Robuchon’s “stable.” Not every course was a winner, but you see his insistence on perfection and his attention to detail that influences every item on your plate Some dishes were transcendent – the caviar and haricot vert, the foie gras and eel, the frogs leg, the langoustine, the lobster and the duck. Some were poor – the truffle, the tuna and the tofu and spinach. I am glad I went, but would I make a special trip to Las Vegas just to experience this meal again? – no. But if you are in Vegas, win big at the tables or some one else is paying do it once.